AMCHAM T&T has partnered with CARIRI and the IDB Lab to host a business accelerator programme for tech entrepreneurs. The accelerator programme is meant to foster growth in the technology sector in Trinidad and Tobago as we recognize that entrepreneurship is a driving force for growth and innovation in any economy. This programme is part of the wider initiative to create a truly connected tech ecosystem in Trinidad and Tobago that will drive real change and make us more competitive globally. It is part of AMCHAM T&T’s first annual Tech. Hub. Island Summit (t.h.i.s) which will be held on June 13th and the 14th at the Hyatt Regency, Trinidad. Are Tech Entrepreneurs or a significant part of their business is facilitated by technology. The deadline for applications is Friday 26th April 2019, and the programme is free for all applicants and successful candidates. The top 25 candidates will be selected for interview and out of this ten will be selected for mentoring and training in Financial projections and valuations, Business Model Development, Market Strategy, Development of Sell Sheet and elements of an effective pitch and Pitching Practice. Pitching practice will be done by IDB and their partner CARIRI as part of the Lab Idea Advisory Services Program. The theme of the conference is “The Fourth Industrial Revolution” and aims to bring together the public and private sector as we advocate for all companies in all industries to embrace tech and infuse it into their DNA. On the Industry side, AMCHAM T&T believes that Tech industry is a major pillar of a diversified economy. It is also a critical component in creating high-value and exciting jobs, that encourage our young people to stay in Trinidad and Tobago even as they work and play in the global value chain. A tech industry can attract both local and foreign investment and increase competitiveness. How is tech changing the world? Or should that question be, how isn’t tech changing the world? 88% of Fortune 500 companies from 1955 are no longer part of the Fortune 500. According to a Global Web Index report, 16 – 24-year-olds spend over three hours a day on social media. A PwC study found that, in the immediate future, business execs are turning to artificial intelligence (AI) to alleviate menial tasks, like paperwork (82%), scheduling (79%), and timesheets (78%). Doctors are already producing made-to-order body parts. Roads and houses are 3D printed. And how is tech changing T&T? At AMCHAM T&T, we believe that the answer is “not quickly enough”. Now I’m not saying that good work isn’t being done. But it often happens in pockets, with little collaboration. We need a truly connected tech ecosystem to drive real change and make us more competitive globally. You see, tech is both an industry and an enabler. Embracing tech and infusing it into your business processes and indeed, into the very DNA of government services, will make our individual businesses and our country more competitive and, I dare say, make our people happier through the delivery of better, higher-quality services from both the public and private sectors. On the Industry side, the Tech industry can be a major pillar of a diversified economy. It can create high-value, exciting jobs, that encourage our young people to stay in Trinidad and Tobago even as they work and play in the global value chain. A tech industry can attract both local and foreign investment. A meaningful, dynamic tech industry could change the essence of how we live, work and play in T&T. And though that may seem like a distant dream to some, we at AMCHAM T&T really believe that this can be a reality in the near future. Already the industry is being catalysed by a changing mindset in traditional businesses that realise the careful infusion of tech into their businesses will allow them to reach global markets and leapfrog some traditional growth problems. Already, a small but dynamic group of your entrepreneurs are building their businesses and the foundations of a tech industry through robotics, AI and data analytics companies. In universities, work in the tech space is quite advanced. Hackathons and other competitions to identify tech solutions for social and business problems are becoming more and more popular. The government through organisations such as IgovTT and TT IFC are attempting to introduce elements of e-government. However, if the tech industry is to explode, somebody needs to find a way to bring these groups together. Through this, AMCAHM T&T is hoping to do just that. Other markets get this. Investors and innovators are committed to growing the tech ecosystem in Africa, resulting in the number of technology hubs across Africa doubling in less than a year. According to Global telecoms industry body GSMA’s Ecosystem Accelerator, a total of 314 tech hubs and incubation centres were recorded in Africa in July 2016. This is an increase of 268% from the centres recorded by the World Bank in 2015. So what’s the AMCHAM T&T strategy? 1. Collaboration: Our Digital Transformation Committee was formed in December 2017; the Committee includes leaders from inter alia, Massy, IBM, Microsoft, PwC, EY, Citi, First Citizens, DeNovo, Atlantic, Fujitsu, the IDB and government involvement through the likes of the TTIFC, CARIRI and iGovTT. 2. Conversation: 2019 will see us holding a series of TECH talks. Our first TECH talk took place on 18 March 2019 at the Bungalow and featured the U.S.’s Suzy and Ted Teele – Head of Marketing and Communications at Advanced Robotics and Manufacturing (ARM) and CEO of Touchtown respectively – both tech entrepreneurs speaking on lessons learned starting a new technology company. 3. Conference – Let’s get real, none of this will have an impact if there is no tech nexus. So we’re going to be holding Tech Hub Islands Summit (this) annually. Let’s talk about this – a two-day summit with a mashup of networking, education and tech, taking place from 13 – 14 June at the Hyatt Regency. this is not a Conference about policy and abstract ideas. It’s not about wish-lists and what-ifs. this will give the private sector practical tech suggestions to improve all facets of business, encourage the government to modernise and create a marketplace for the free flow of ideas, giving birth to partnerships and innovation. Our cast of speakers includes IBM Director of Cognitive Service Foundations and Master Investor, Dr Nick Fuller, Co-founder of Vonage and Serial Entrepreneur Jeff Pulver, Head of the Machine Learning Department at Carnegie Melon University, Roni Rosenfeld, former Chief Digital Officer of NYC Sree Sreenivasan, Managing Director of Hardware and AlphaLab Gear, one of the US’s top 25 tech accelerators, Ilana Diamond and Google Product Manager in AI and Health, Dr Kwame Johnson. We’re partnering with CARIRI and the IDB to launch an accelerated programme for tech entrepreneurs to pitch to more established companies. We’ve got Republic Bank, Massy Technologies InfoCom, PwC, and United on board as sponsors. And we’ve got topics like The Fourth Industrial Revolution, e-Government is good politics!!! (with three exclamation points), Leadership Panel: Is Your Business Model 4-IR Fit?, Unlocking the Power of Data to Transform Your Business and Man & Machine – The Workforce of the Future. this is not some one-hit-wonder Conference that we’re having just because we have a history of successful conferences. this is urgent. And it’s part of a wider vision to build a booming tech industry in T&T. T&T ranked 78th out of 140 countries in that Global Competitiveness Report 2018-2019. We all want to do better. The good news is – we can. Technological leapfrogging is happening all around us. We don’t have to be stuck where we are. And we don’t have to be afraid. We need to collaborate. We need to converse. And we need this conference to create the change we want to live. I would like to begin my remarks today with a quote by Melinda Gates author of The Moment of Lift. She says that “a world without sexism would be a world with fewer barrier between girls and the women they dream of becoming. We’d see women leading and shaping all aspects of society – fully empowered as decision makers in their families, their communities, their governments and their workplaces.” As President of AMCHAM T&T, I fervently believe this, and I am here today to share a few things we have done at AMCHAM T&T to ensure this vision of women being fully empowered happen today and into the future. With that, I say welcome everyone to AMCHAM T&T’s 6th Women’s Leadership Conference. It is indeed an honour to be in this room filled with talented women and forward-thinking men. Each year International Women’s Day is built upon a theme that sparks awareness, and results in encouraging individuals, business and corporations to take action. This year’s theme #Balance For Better invites all men and women globally, to take concrete steps to help accelerate the achievement of Gender Parity. The focus is not only on taking action but also on being accountable. Six years ago, AMCHAM T&T decided to launch its first Women in Leadership & Networking series, in recognition of International Women’s Day. After the success of our first event “Sowing The Seeds of Change”, we recognised that as a business organisation we had a role to play in initiating and fostering positive change in society. What began as a seminar aimed at networking has evolved into a forum for bold and candid discussions on inclusiveness, diversity and accountability. Today’s event is a positive step in this direction as we facilitate dialogue, which is needed, if we are to ensure that women are not only inspired but are also able to live in an environment that are fair and equitable. More specifically, the aim is for women to be able to exist in environments where they can thrive, be ambitious, gain success and not have the concerns of being negatively labelled, sexually harassed, bullied or have workplace bias, colour, cultural background and pregnancy impact their career progression. However, even with our great aspirations today, it would seem that gender equality still remains a distant dream. We have all seen the numbers, yes? If you have not, let me recap some of them for you. According to World Bank data, globally, we’re heading in the wrong direction, women’s labour force participation fell from 51.3 percent of women in 1990 to 48.4 percent in 2018. Research by the Organisation for Economic Co-operation and Development (O.C.E.D) estimates that factors stifling the economic potential of women cost the global economy up to $12 trillion. Yes, 12 trillion with a “t” dollars. The Global Gender Gap Report 2018 published by the World Economic Forum indicated that with the current rate of progress it may take another 202 years to close the economic gender gap. Locally, while there is gender parity up to middle management, at the C-suite level the ratio falls to less than 25% female participation, and the figures are even less when it comes to representation at the Board level. These and many other statistics show that even though gender parity is good for business and the economy, the pace with which progress is being achieved is not enough to close the gender gap any time soon. How can we increase accountability in our businesses and personal spheres of influence, so that we can change 202 years to twenty years – or less? AMCHAM T&T continues to ask these questions, because we believe that equality is not a female issue, but an issue of fairness that happens to also make good economic sense and is a necessary element of a progressive society. We recognise that the responsibility in achieving equality does not solely lie with the government but requires true collaboration between government, companies, NGO’s society at large if the 50/50 dream is to be realised. All stakeholders will need to step up, acknowledge the role they play in maintaining the status quo and start to implement crucial actions needed to change it. We also believe that we must walk the talk and begin to live the things for which AMCHAM T&T advocates. In 2017, we partnered with the IDB to introduce the Women In Leadership Mentorship Programme, where we paired female employees from our member companies, with mentors from the IDB global network of professionals. We are happy to report that after a successful first cohort of seven mentees, this year’s group of mentees has increased to twenty-one. That is an increase of 286%, and what I believe is a testament of the value and need for such a programme. We also decided that this year we would extend the opportunity of mentorship to members of the AMCHAM T&T Secretariat. It was Mother Theresa who said, “If you want to change the world, go home and love your family”. We at AMCHAM T&T cannot be a champion of change without instilling that change into the very fabric of our organisation. We must put action to our words and ensure that we lead by example at all levels in our organisation. Just a year ago, our then President Mitchell De Silva stated that his wish was to hand over the reins of AMCHAM T&T to a female president. Thanks to the encouragement and support of Past Presidents, Board and committee members, I was elected the 15th President of AMCHAM T&T three months later. I stand here knowing that my story is part of a larger story. A story that began when some audacious women- U.S. Ambassador Sally Cowell, Nisha Lau and June Maharaj and others came together to conceptualise an organisation that would alter turn into the American Chamber of Commerce of Trinidad & Tobago. It is on this history that I will continue the work of all the leaders who came before me. This is something I believe we all have in common. Like me, you carry the hopes of your parents, the hopes of the teacher who believed and encouraged you, the hopes of the mentors, bosses and others who continue to push you to achieve your greatest potential. It is the same way AMCHAM T&T continues to push the agenda of our members, and are unafraid to have bold conversations and take a set at the table where we choose to be a symbol of audacity and strength not only for this nation but for the Americas; not only on this issues but any issue around fairness, equity, transparency and accountability. After this year’s A.G.M, I expect that AMCHAM T&T will be just shy of parity on our Board as we anticipate that seven of 16 Board Members will be female – extremely well-qualified women at that. So, I would like to throw out a challenge to my colleagues in the business community – if your Board comprises fewer than 35% women, commit to adding at least one woman to your Board every year until you achieve at least that ratio. Although I would argue that parity should be your goal. I have been in business for a long time and I assure you that there is no shortage of capable, well-qualified women. If you need references or recommendations, just ask anyone in this room or connect with me as I am happy to help! I would like to take the time to acknowledge the men in the room. As Emma Watson said in her speech at Davos 2016, “It is time that we all perceive gender on a spectrum, not an opposing set of ideals.” Bringing men into the conversation in a productive and open-minded way is a crucial step to making progress on issues of gender inequality. We thank you for your support and your willingness to learn. This is the one place that you are outnumbered, but hopefully this begins to change. To all the talented and amazing women in this room– do not apologise for your uniqueness, your passion and your ideas. Keep pursuing excellence and continue to speak up not only for yourself but for all. Let us see what happens when we all use our voices and institutions to advocate for gender parity, prosperity and a more equitable future. In closing, I would like to recognize the commitment of our CEO Nirad Tewarie and the AMCHAM T&T Secretariat to organising this event. A special thank you to Francisca Hector for all her hard work and dedication over the past few months. Thank you to all our sponsors for your continued support over the years. We hope that the conversations today will inspire each of us to take actions to support and drive economic opportunities for women around the world. As we learn a bit more about the landscape of women’s equity issues, strategies for work-life balance, risk-taking and career mobility. I am confident we will exceed our own expectations if we remain committed and accountable. It is my pleasure to address you here this morning as we celebrate the culmination of all the hard work of the teachers and students over the past two months. The National Youth Productivity Forum is a programme that is integral to the fabric of AMCHAM T&T. We believe that creating a better economic future for our country means taking an active role in the development of the youth of our nation. Students, it is our hope that this interaction has challenged you and inspired you. It is our hope that you better understand that in order to be able to speak authoritatively, you must first listen, then consider other points of view and different perspectives to issues. It is only when we see beyond the moment, see beyond just one issue that we can find holistic and long-term solutions. Winning the argument for the sake of winning is never important if, in winning, we know that we undertake action that is neither in our best interest nor the best interest of the various groups to which we belong. Safety and security are on everyone’s minds. We continue to see headlines in the daily newspaper and social media reports detailing instances of bullying, violence and criminal acts. In January 2018, Form Five student Jaden Pereira of Signal Hill was beaten and hit with a concrete block by another student. Pereira suffered a fractured skull and had to be airlifted from Tobago to the Port of Spain General Hospital in Trinidad for treatment. He survived. The incident forever etched in our minds as the fracas was recorded and the video posted and circulated via social media. In February of the same year, a trainee teacher was robbed at gunpoint in the school yard by someone who had entered the school compound. While she was not seriously harmed, one can only imagine the psychological harm inflicted in such an attack. In January 2019, six female students of Diego Martin North Secondary School were suspended after a video surfaced of them smoking something that appeared to be marijuana, in their school uniform. The level of indiscipline, bullying and violence that continues to occur in our schools are a legitimate concern for everyone. In times past schools were seen by students as a safe place away from their sometimes-tumultuous home life or crime ridden community. Today those havens have turned into battle grounds. It would be remiss of me if I were to stand here and not acknowledge that for every report of wrong doing in our schools there are students who continue to go above and beyond to do what is right. On social media in February 2019 two young men from Tranquility Government Secondary School were photographed helping an elderly man change his tyre in Port-of-Spain. Students from Chaguanas North Secondary school developed an app to anonymously report bullying. Students indicated that the app was developed from a desire by students to make TT a “safer and better place”. Students continue to excel in academic, arts, athletics, representing their schools and this country proudly. How do we then bring balance to a system that appears to be broken and at times chaotic? How can we move from having a zero-tolerance approach to school violence to having zero incidence? To answer these questions, we believed that it was important to hear from the persons most affected – the students. It could be easy to assign blame. The government, business, teachers and unions or even civil society. Each can be charged with not doing enough to promote safer schools. However, as the students so excellently demonstrated a solution can be found when we all try to work together. Business leaders also need to take individual responsibility for creating a world that is safer and a better to place to live. We can choose to start small, simply by choosing to be a good neighbour. Small actions add up to big results. In the wake of the floods in November 2018, we say how small acts of kindness and generosity all added up to make a world of difference to the families who were gravely affected. The business community wasted no time and stepped in to assist. This year’s theme is meant to ingrain the notion that the seeds which we plant today in the form of ideas and actions influence what we will reap tomorrow. I would like to take a brief moment to speak to directly to the parents and teachers. As a parent I can testify that the best way to establish student success is to ensure that parents and teachers are allies. Building partnerships between parents and teachers must begin with non-judgmental communication. Teachers must listen to parents and parents need to take the time to understand where teachers are coming from. Far too often parents and teachers both are guilty of dismissing the other’s viewpoint. This leads to miscommunication and misunderstanding. The more dismissed you feel as a parent the less likely you are to actively participate in your child’s school life, as teacher, the more you feel like you are being ignored or misunderstood the more likely you are to stop communication with a parent. I would like to congratulate this year’s winners, as well as their teachers and parents. We know it is no easy feat to find the time in a world full of commitments, but we hope that you can see for yourself the growth in the students and we look forward to your continued support. I also hope that this experience has made a meaningful and indelible impact on your perspective on how you can impact the world. I would like to take the time to express my gratitude to Neerala and the team at the Secretariat for their commitment to ensuring that this project happens every year. To the sponsors we remain ever grateful for your support, as well as the teachers and school administrators who continue to see the value in this programme. To all students, the future leaders of our great country, one lesson I hope this experience has imparted on you is that you cannot do it alone. This is one of the reasons we have team discussions and not individual debates. It is through collaboration and this team effort that we overcome our greatest challenges. I also encourage you to dream. Dream big and dream loud. Don’t be bogged down by the cynicism of society or your past experiences. Instead, seek to marry your knowledge with those experiences so that you can orchestrate the future you desire. Before I close. I would like to note that last year we were challenged by Her Excellency to ascertain if the NYPF was having a positive impact on the students. I am happy to say that we accepted the challenge and we are working with our partner UTT to do a tracer study on the almost 1,500 student graduates of the program to date. For the honour of your attention and for the countless hours you put into preparing for the NYPF, I thank you. A high-level discussion between United States Deputy Assistant Secretary of State for the Western Hemisphere, Dale Eppler and CEO of AMCHAM T&T Nirad Tewarie took place at the Outlook For the Americas Forum hosted by the Association of American Chambers of Commerce of Latin America and the Caribbean (AACCLA), in February 2019. One of the main issues discussed at the meeting was the recent passage of the Better Utilization of Investment Leading to Development (BUILD) Act in October 2018 in the United States through the U.S. International Development Finance Corporation (USIDFC). Sec. 101. Statement of Policy: It is the policy of the United States to facilitate market-based private sector development and economic growth in less developed countries through the provision of credit, capital, and other financial support. Sec. 102. United States International Development Finance Corporation.102 (b) PURPOSE.—The purpose of the Corporation shall be to mobilize and facilitate the participation of private sector capital and skills in the economic development of less developed countries, as described in subsection (c), and countries in transition from nonmarket to market economies, in order to complement the development assistance objectives, and advance the foreign policy interests, of the United States. In carrying out its purpose, the Corporation, utilizing broad criteria, shall take into account in its financing operations the economic and financial soundness and development objectives of projects for which it provides support under title II. country access to capital that can assist in our development. Furthermore, no access can place T&T at an economic disadvantage to other countries who will receive support. While there is much work still to be done on this, State Department officials indicated that they are aware of the issue and are willing to continue discussions on the matter. The Outlook For the Americas Forum is an annual event where CEO’s and Board members of AmChams in the Western Hemisphere come together to discuss pressing business and economic issues affecting countries in the Americas. AMCHAM T&T continues to show its reach and impact across the region. 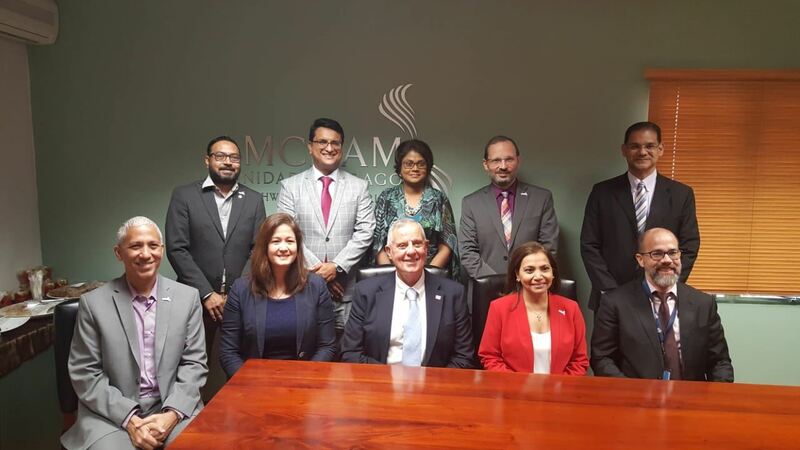 United States Ambassador Joseph Mondello met with members of the Board of the American Chamber of Commerce of Trinidad & Tobago (AMCHAM T&T), on Thursday 5th February 2019, where the Board presented some of their members’ issues to the U.S. Ambassador. While the executives of the Board have had several interactions with Ambassador Mondello - including his first public appearance at AMCHAM T&T’s Health, Safety, Security and Environment Conference in 2018 - this is the first time Ambassador Mondello visited the chamber’s building. “I think this is a positive step, and what we believe will become a regular occurrence as we continue to strengthen our relationship with the U.S. Embassy,” said AMCHAM T&T President Patricia Ghany. Some of the issues discussed at the meeting include: the current business climate in Trinidad & Tobago, ways Trinidad and Tobago can attract and keep foreign investors, opportunities available for local companies to do business with the United States and the current humanitarian crisis in Venezuela. “Increasing bilateral trade and investment is one of my top priorities as Ambassador. I look forward to continuing our excellent partnership with AMCHAM to make this goal a reality,” said Ambassador Mondello. AMCHAM T&T is concerned about Trinidad and Tobago’s continued non-compliance with Global Forum requirements and is urging both Government and Opposition to address the outstanding legislative requirements in the shortest possible time. We call on the Government and Opposition to conclude deliberations on the Mutual Administrative Assistance in Tax Matters Bill, 2018 and the Tax Information Exchange Agreements Bill, 2018 which are currently at a Joint Select Committee (JSC), and bring the required legislation to Parliament urgently. The Bills were introduced in Parliament in May 2018 and have been before a JSC since. Moreover, since the November 2018 deadline for passing the legislation, there has only been one meeting of the JSC on public record. AMCHAM T&T believes that the Government should move with alacrity to convene JSC meetings in order to bring the legislation to Parliament and pass these critical pieces of legislation. The Government should also update the country on the remaining steps to achieve compliance and the deadlines to meet these compliance requirements and we urge the Opposition to clearly identify their concerns so that both parties can work in a collaborative manner to pass the legislation. We believe that information from external entities such as the Global Forum and the EU regarding the required steps, timeline and consequences for failing to meet deadlines should be clearly articulated and the relevant supporting documentation be made public. AMCHAM T&T is deeply disappointed by the continued delays, posturing and political wrangling that is contributing to the lack of passage of the critical legislation that will contribute to compliance. In addition to the non-compliant rating under the OECD tax transparency standards, the Council of the European Union, another body responsible for setting tax governance standards, included Trinidad and Tobago in its list of non-cooperative jurisdictions for tax purposes. Further non-compliance by the stipulated deadlines could pose major challenges for operations of financial institutions and in turn gravely affect our ability to do business with the rest of the world. To avoid the penalties of non-compliance, such as stricter reporting requirements and multinationals and loss of correspondent-banking relations, among other things, it is imperative that legislators on both sides of the House commit to passing the legislation forthwith. We trust that our legislators will put politics aside to ensure that the interests of Trinidad and Tobago come first. Violence and indiscipline in schools in Trinidad & Tobago has been a perennial issue for government and school administrations. With an increase in the number and severity of violent incidence in schools many are struggling to come up with credible solutions to stem what has now become an epidemic. With this in mind, the American Chamber of Commerce of Trinidad & Tobago (AMCHAM T&T) decided to focus its annual National Youth Productivity Forum (NYPF) on the impact of unsafe school environments on students and the long-term impact it may have on our economy and country. With the chosen theme for the 2019 Forum - "Safer Schools … Towards a More Productive T&T" – AMCHAM T&T launched the program with over 150 students attending the two-day training sessions on Thursday 24th and Friday 25th January 2019 at the Chaguanas Borough Corporation. AMCHAM T&T believes that discussing this topic is extremely important if our society intends to address bullying and take meaningful steps to end school violence. The forum allows students to discuss among their peers’ ways of improving the currently fearful environment they face in the classroom, and the negative impact it has on their concentration and academic performance. The NYPF demonstrates to the students; inter-connectivity between the 4 major stakeholders in society - business, government, labour and civil society. This initiative highlights that the answers do not reside with any one group, but also that no one group is responsible for the problems of Trinidad and Tobago. The Forum goes further to compel students to think critically about solutions to national problems and to look at how these solutions can be implemented. AMCHAM T&T has taken this bold move because we believe that our future leaders, entrepreneurs, activists and employees must understand their critical role in propelling Trinidad and Tobago forward. We thank you for coming out today for our annual Economic Outlook event, as we bring you the opportunity to interact with some of our country’s most prominent thought leaders. AMCHAM T&T continues to host forums such as this because we believe that it is important to facilitate open dialogue with our members and the wider Trinidad and Tobago. Many people, from all walks of life take time out of their business and family time, year after year, to build organisations. We do this because we see it as a way not only of getting – increased knowledge, contacts, relationships – but of giving back. Giving back to a country that has given us so much. A country that is unique. A country that, in our opinion should be the epicenter of hemispheric, if not global trade. So, we can lament where we are and why our country is persistently under-performing. We can debate whether the glass is half full or half empty. Whether the liquid in it is red or yellow. Or we can acknowledge that the country is under-performing and has been for quite a while. We can look at the glass and accept that the colour of the liquid in it doesn’t matter. Nor does whether it’s more full than empty. We can look at the glass and realise that it can always be re-filled. So too can our country and our economy, become more dynamic if we want it to be. If we make it so. Each day brings with it the opportunity—and the excuse—to make a new start. With the right mindset, there is substantial optimism to be harvested from the idea that starting afresh is possible, and that new beginnings can create new and successful outcomes. As we look to the future, we see some of the most dramatic changes in human history—social, technological, and economic—changes that offer unprecedented opportunities – at least if that’s our perspective and if we are willing to act today to secure tomorrow. The reality is that Trinidad and Tobago is at the centre of these changes- or if we don’t act, the centre of the effects of these changes. Our main economic driver, the gas industry is changing. Once our largest recipient of gas, today the United States is poised to be a major gas exporter. We have to be cognizant of what that means for the future of our petrochemical industry. With Venezuela in virtual chaos, just miles away from us, we have to be mindful of the geo-political and military games being played there. We therefore need to be deliberate and strategic in our responses. With trade wars, walls and barriers as well as moving targets being set by developed world institutions, the only way a small state like Trinidad and Tobago will thrive is if we have a clear plan, be proactive and are both deliberate and nimble in our responses. When we look at this quote in the context of our national economy, we need to ask our leaders, ‘Are we doing more of the same with the hope of getting better results?’ It often feels as if we are. So, what and how can we do things differently? As we integrate the notion of the Fourth Industrial Revolution into the definition of competitiveness. We recognize that emphasis on the role of human capital, innovation, resilience and agility, are not only the drivers but also defining features of economic success in the 4th Industrial Revolution i.e. today and into the foreseeable future. Trinidad and Tobago is ranked 105 among 190 economies in the ease of doing business, according to the latest World Bank annual ratings. Our rank has deteriorated to 105 in 2018 from 102 in 2017 and from 34th in 2000. Although there were only 75 countries in the survey that year, such a rank would still have put us in the top half of performers. For us to reverse this dangerous slide the state and our businesses need to modernise. We need to proclaim loudly, not by words but through action, that Trinidad and Tobago is open for business. That our politicians and public service operate efficiently and transparently. That our businesses are dynamic and internationally competitive. Therefore, in my view, digital transformation is the most critical component that will determine the future relevance of our firms and our economy. Next, technology must be embraced as the growth-driver and game-changer that it is. Technology is not a single, all-powerful industry. It is now a part of every industry. It will continue to change the way we work, communicate, and live—at a rapidly accelerating pace. Even with these changes, technological advancement is an opportunity, not a threat. All the recent projects announced by the Honourable Prime Minister are all focused on infrastructure. One key part of infrastructure - and I would posit the most important part for the future is missing. The country’s digital and technology infrastructure. The reason we talk about digital transformation is because technology is disrupting every industry – from the common example of hotels and taxis to ones you would never think of such as the measuring tape industry. For Trinidad & Tobago to be competitive as we enter a new decade, we must have a strong digital infrastructure. From the human capital in terms of coding, which must start at the early childhood level and general ICT skills to a robust telecommunications infrastructure and digital government services to facilitate this transformation. One area of diversification often highlighted is financial services – the future of financial services is Fin Tech – yet we have no discussions on attracting/developing or incubating fin Tech companies nor any discussion on effectively regulating this industry. We must move beyond just back office services and move into the attraction and development of cutting-edge, fintech firms operating in T&T. The opportunity to take advantage of this disruption is there – are we going to be like other small countries and find a niche for ourselves like Malta which is becoming a global center for coin offerings based on block chain. Many of the developing countries of the world are all taking advantage of the effect of disruption – which is to level the playing field for all – will Trinidad & Tobago do the same, or will we be left behind while this new wealth is created elsewhere. To do this effectively we need to drastically and rapidly improve our ease of doing business. Linking digital transformation to improved government services: e-procurement and the drafting of legislation offer two possible quick wins. Let’s face it, at the very least, the perception of corruption in this country is too high. TSTT has already developed a product that can be utilised for a robust e-tender process and of course there are other solutions. Implementation of such a system will speed projects along and reduce the opportunity for corruption. On the other hand, our legislative process is too slow and cumbersome. Just across the Caribbean Sea in Jamaica, the government has introduced an e-legislative process, to speed the drafting of legislation and allow stakeholders to see the progress and comment on legislation throughout the drafting process. The implementation of a unique national identifier for every citizen will speed up the process of accessing government services, reduce the opportunity for duplication and easily flag instances of corruption within the system. We can do that quickly and easily. Whether we do these or other things, we must do something to reduce the slide. We must act decisively and implement efficiently. As we do these things however, we must reduce the deficit. Already it is costing too much to service our debt. Legacy debt continues to be an issue that we grapple with for successive governments. We continue to borrow to build and borrow to pay. We do acknowledge that there must be some level of borrowing in an economy, but this must be used, as we do in our businesses, to fund growth and revenue generating initiatives not just recurrent expenditure. AMCHAM T&T has continually voiced its concern with the level of borrowing and the ramifications this will have for future generations. Children who will live in a future far more uncertain that the one we live in today, will be burdened by the results of the choices we make today. We noted with trepidation when the 2018-2019 National Budget showed that expenditure would increase by the same rate as the expected revenue while the country would again be running a deficit. With the Minister saying that the Government was comfortable moving toward a 70% debt to GDP ratio. However, we all know that this ratio will fall if GDP is increased. Therefore, in more ways than one, returning to growth must be the main focus of government policy over the next few years. In this pursuit we need to attract local and foreign investment. We remain committed to working with the Government to do just that and are confident, with some refocus and a little adjustment, our country can achieve this. AMCHAM T&T will continue to connect with potential partners, mentors, and investors to help take ideas and businesses to the next level. Our continued commitment to you, our members, is to focus on how we can support your growth and be an effective voice on your behalf. We look forward to hearing from our presenters as they discuss ways to do just that and to working with you all as you strengthen and grow your businesses to contribute to what we all hope is the beginning of an economic and social renaissance in T&T. As I close, I again refer to Paul Romer who said “Every generation has underestimated the potential for finding new ideas . . . Possibilities do not add up. They multiply”.